Dell EMC’s VxRail is selling like hotcakes, I was lucky enough recently to attend a one day overview session on the product. The training was really good and I wanted to share what I had learnt to present a high level overview on what VxRail is about. What else do you get with VXRail? You may also hear VxRack mentioned, this is the bigger brother to VxRail with the software defined storage provided by ScaleIO. Networking using VMware NSX is also an option. How many nodes do you need? The minimum number of nodes required is three, although 4 is recommended to allow overhead for failures and maintenance. This is also the minimum number of nodes required to use erasure coding rather than mirroring for data protection. How do you manage VxRail? The system is managed from two places. You will be spending most of your time in the vSphere web console since all vSphere management is still performed from here. Also since the storage is being provided by vSAN this is also managed within vSphere. The second tool you will need to become familiar with is VxRail Manager. There is the option to create a new vCentre which will be housed within the hyper-converged infrastructure it’s self or to use an external vCentre. The choice to use an internal or external vCentre can be set during the initial deployment wizard. Update – As this is a hyper-converged system upgrade of all components can be completed from the VxRail manager. 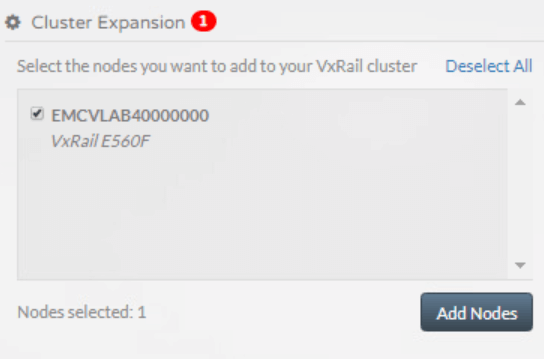 You add a node using the VxRail Manager as shown in the screenshot below which is a non disruptive process. Hybrid and all flash models cannot be mixed plus the first three nodes in any cluster must be identical after this you can mix and match models . Although there is something to be said for maintaining consistency across the cluster so it is balanced and will probably make managing it easier in the future. The cluster can be scaled to a max of 64 nodes. How do I take a node out for maintenance? Since the data is stored inside each of the nodes there are some additional considerations when putting a node into maintenance versus using a traditional SAN. When you do put a host into maintenance mode the default option is ensure accessibility it makes sure all data is available during maintenance, although redundancy may be reduced. Disk groups – Each disk group consists of a caching disk which must be an SSD disk and 1-7 capacity drives. The capacity drives can be flash drives or spinning disks in a hybrid setup. All writes are made via the caching disk, 30% of its capacity is also reserved to act as a read cache. RAID 5 – Stripes the data across nodes, more space efficient but reduced performance. What is a VMware Metro Cluster? A VMware Metro Cluster (vMSC) is also sometimes called a stretched cluster which gives more of a clue to it’s function, since it allows a single cluster to operate across geographically separate data centres. This ability to operate two locations as a single cluster gives significant benefits in terms of availability both for planned and unplanned outages. How does a Metro Cluster Work? A Metro Cluster allows VMs spread across data centres to act like they are in a single local cluster. In order to allow this functionality the VMs need access to the same storage at both sites, this is achieved with products like NetApp’s Metrocluster and HPE’s Peer Persistence products which enable a single view of the storage even though it is located in a multi site configuration,this is depicted in the diagram below. Let’s dig into how this works. Each LUN is replicated between both storage systems using synchronous replication, however only one LUN can be written to at a time, whilst the other remains in a read only mode. The writable LUN is presented out to the hosts via active paths, the read only LUN is effectively hidden by the paths to it being marked as standby. This is based on ALUA (Asymmetric Logical Unit Access), which was used in traditional storage systems like the EMC Clarion. ALUA was used to mark preferred optimized paths to the controllers owning a LUN and non optimized paths marked indicated indirect paths to the LUN. The non optimized standby paths would only become live if the primary path failed. Below shows an example of the paths on a ESXi host connected to a Metro Cluster, the live paths are shown as active but this can be switched over using the storage array management software so that the active and standby paths reverse. What are the requirements FOR A STRETCHED CLUSTER? vSphere vMotion network has a redundant network link, minimum of 250Mbps. HA APD – The response for an All Paths Down needs customising, you will find the setting in HA settings after selecting Protect against Storage Connectivity Loss you will then need to select Power off and restart VMs. For an automated fail over of the storage to occur there are a number of failure conditions that must be met, those conditions that must be met for 3PAR are summarised in the following table from HPE. Essentially contact needs to be lost with the storage array and replication needs to be stopped. Remember tests 3 and 4 do incur risk, perform them at your at your own risk and only if the project requires it. Wow time passes quick, it seems like only yesterday I was voting for the top vBlog, but it turns out an entire year has passed and voting for the top vBlog 2016 is now open. For those that are unfamiliar Top vBlog is ran by Eric Siebert the guy behind the vLaunchpad, and is a competition to find the hottest Vmware /Virtulisation /Storage blogs out there. Deciding who has the best blog is done by the most important people, you the readers! This year’s competition has kindly been sponsored by VMTurbo.